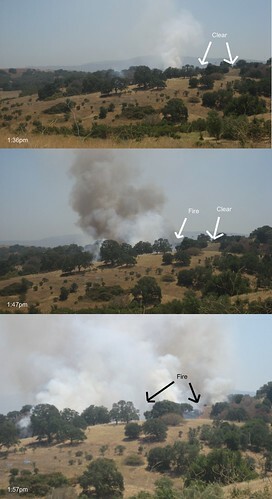 Before I get evacuated (not a completely crazy idea with the sheriff right outside my office), I thought I’d post just how quickly fire can spread depending on the circumstances. I realize those are not on the same scale, but the surrounding trees should help identify the areas. Understand that I was just trying to do some work this afternoon and then headed out periodically to take some pictures. I didn’t set up shop for a sequence. The distance between the fire and the nearest road is quite big so eventually the firetrucks just had to head up on the hill. By the time I finished taking photos that entire patch was dark although it looked like the flames had subsided. Of course, that’s just the part I can see, chances are there is lots of action invisible to me from here. Now I’m going to try to get back to work, helicopters notwithstanding. This entry was posted on Thursday, July 5th, 2007 at 4:55 pm	and is filed under General update, Palo Alto, Photos. You can follow any responses to this entry through the RSS 2.0 feed. Both comments and pings are currently closed.